For CURRENT news stories, please use the menu above. The 2011 Green Hills AGM was held on Sat 3rd Sept in the RSL Hall in Maleny. A briefing on progress on environmental matters in the Maleny Community Precinct was included, along with a short slideshow presentation. Many Green Hills members and friends of Obi Obi Parklands attended. The listing of species of animals found in the proposed parklands site was well received, when shown as a slide show. You can see the images here. As part of the 2011 Festival of the Walks, there was another opportunity for supporters of the Obi Obi Parklands to walk over the precinct site. The walk took place at 1PM on Saturday 20th August. and it was well attended. The walk started at the end of Porter's Lane and followed the new road down the ridge towards the Obi Obi Creek with the Southern Wetland on the left and majestic figs on the right. The walkers stopped briefly near the creek to look over towards the northern part of the Precinct then followed the creek downstream, skirting the wetland, traversing open grassland until they reached one of the sites of the October 2010 tree-plant. The walkers then took a detour there, down to a beautiful part of the creek where a grove has been planted. The group then came back into open country and continued on to the south-east corner, giving them an idea of where the new trail will go (which Sunshine Coast Council is planning to build in the next 12 months). The walkers mainly stayed in the open country thoughout, turning north again, crossing the stream below the Eastern Wetland and coming up to the Old Bails, continuing from there through Barung's lease back to the start. Afternoon tea was enjoyed at the end of the walk as well as interpretation along the way on what is happening and what is planned on the Precinct, and on the wonderful opportunity it represents for protecting our biodiversity. At the afternoon tea there were maps and a Q&A session on the Precinct. The first of what promises to be many restoration projects in the wetlands areas of the parklands was commenced this week with an application for funding. Green Hills has made a submission for funding under the Commonwealth Government Caring For Country program 2011-2012 Community Action Grants. Barung Landcare, Lake Baroon Catchment Care Group, and Sunshine Coast Council were all consulted on the application and the most appropriate and urgent restoration area was chosen, being the outflow from the southern wetland area to Obi Obi Creek, and adjacent riparian region along the creek side of the proposed walking trail. Our application is entitled Palustrine Wetland Outflow and Riparian Restoration, Obi Obi Creek, Maleny. You can find out more about these grants via the link. We will keep you updated here and on our facebook page on the progress of this funding application. In collaboration with professional staff from Queensland Museum, Green Hills has compiled a list of birds, mammals and frogs which make the Maleny Community Precinct southern wetlands their home. You can see the list with photos of each species here. Sunshine Coast Council held the inaugural tree planting event on the Maleny Community Precinct on the morning of Saturday 23rd October. 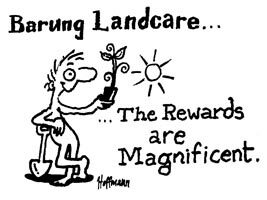 Around 400 people attended the morning and all 4,400 trees and shrubs were planted on two sites in the riparian zone of Obi Obi Creek. "We'd like to express our thanks to the more than four hundred people who turned up to plant trees on the Precinct on Saturday. You made it a very special day. We'd like to especially thank the fifty volunteers who made it all run so smoothly. Thanks to you all for putting the Community into the Precinct." See some photos from the morning here, and also on our Facebook page here. The second planting site has been proposed as a location for a memorial grove in memory of Jill Jordan. Anna Heriot held a lovely ceremony prior to the trees being planted. Here is a Google Earth KMZ map of the memorial grove, and here is the proposed location for the memorial seat and rock. 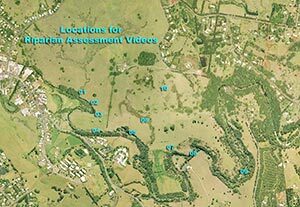 A series of short videos made in 2008 by Dr Les Hall and Steve Swayne have been uploaded to the Friends of Obi Obi Parklands Facebook page. Here is a map showing the locations where the videos were filmed. Click on it for a full sized version. We have decided to make use of the Facebook social networking website to allow the Friends of Obi Obi Parklands to make comments and share information. A meeting was held at the Maleny RSL on Saturday 28th August 2010 advising supporters of Obi Obi Parklands and the interested public on the current progress of the master planning for the Maleny Community Progress and the next steps for Obi Obi Parklands. Sunshine Coast Regional Council has completed the Master Plan and is now looking at the staging of facilities for the Prencinct over the next ten years and more. Disappointingly, the pathway to Gardners Falls has been afforded a fairly low priority. Perhaps it is timely to remind Councillors, Council staff, and the public, of the 2007 public consultation which clearly showed that the pathway to Gardners Falls was the single most requested and supported element for the entire Precinct. Over 2,300 people supported the pathways. The provision of a means for high school children to travel from Maleny township to Gardners Falls by bicycle, and thus no longer being reliant on parent's cars, is long awaited. Preliminary surveying from the Riverside Centre to the edge of the Precinct was completed several years ago. Now all this is on hold. 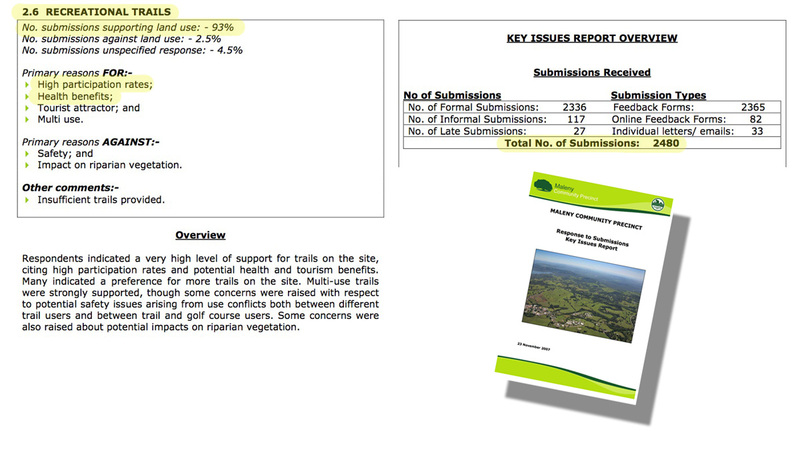 We hope that Council can be persuaded to rethink their prioritisation strategy for this important recreational and fitness amenity for Maleny. Maleny District Green Hills Fund directors, in conjunction with the Sunshine Coast Regional Council staff and contractors, have been busy working on the business case for the proposed Obi Obi Parklands. The final business case document was presented to Council in June 2010. We are now working with Council to develop a Memorandum of Understanding. This will pave the way for funding applications for tree planting, maintenance, fencing, and infrastructure projects in the years ahead. Click on the image to DOWNLOAD the full document in PDF format (1.25Mb). At the Ordinary Meeting of Council on 10 June, council endorsed the final master plan, which will be used as the guiding plan for the staged development of the precinct, which will take up to 25 years to fully develop. 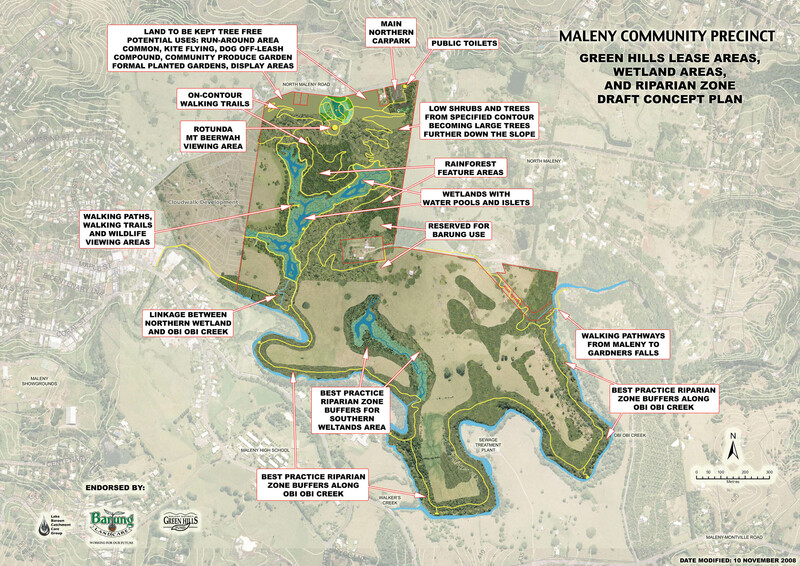 The Maleny Community Precinct Master Plan is a culmination of many years of community and council collaboration to provide community use facilities on former agricultural land. 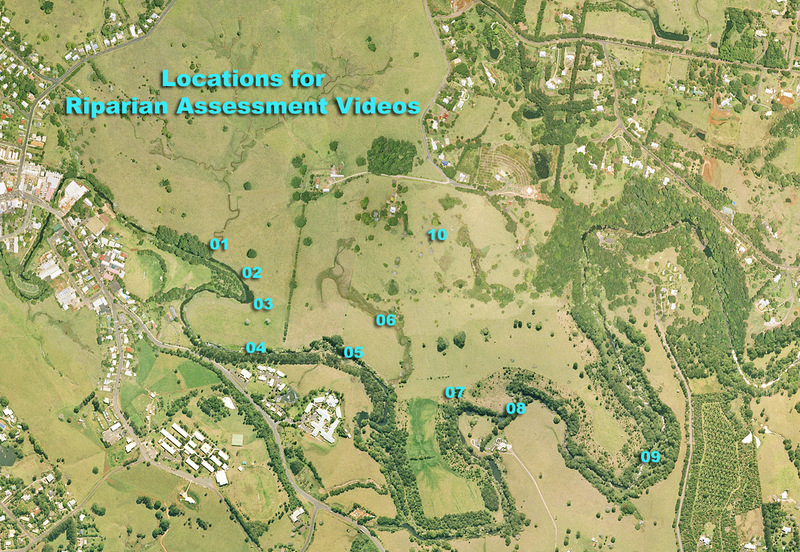 The site comprises of 126 hectares of former dairy pasture located within a kilometre of the Maleny Township. Bordered to the south by Obi Obi Creek, the boundary meanders with the creek as it weaves its way eastwards towards Baroon Pocket Dam. It also contains the state heritage listed Pattemore House. The masterplan recognises the site, its character and is relationship with the surrounding landscape and nearby townscape. It considers the importance of creating a ‘sense of place’ that stimulates social activity, creating a legible precinct character, and providing good connectivity from surrounding areas of human habitation. The plan embraces the importance of ecology and balances environmental protection areas with community activities and benefit. The aim is to protect and enhance significant vegetation and ecosystems, preserve and enhance the quality of stormwater and natural waterways, improve habitat corridors and to create habitat cores — larger pockets of environmental protections areas that will increase regional biodiversity. More details are on the Council website here. See even earlier Obi Obi Parklands NEWS here. 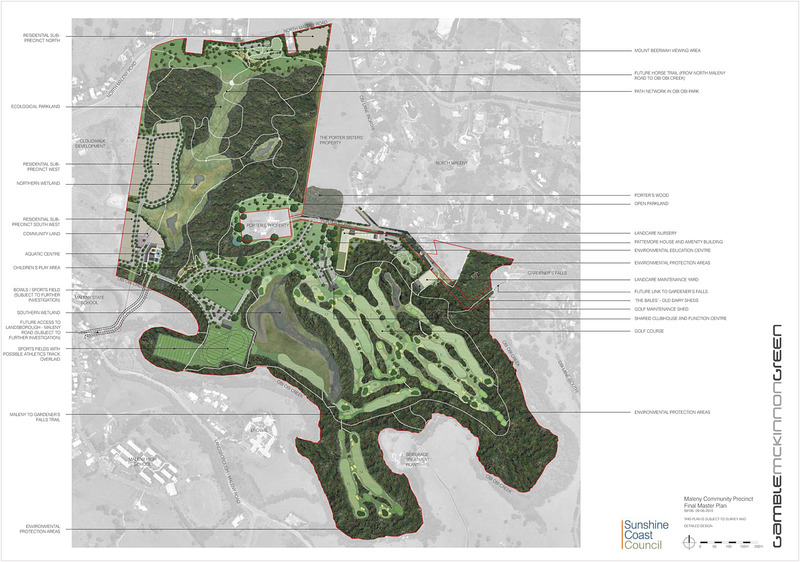 Here are some updated frequently asked questions about the original Parklands concept. Here is the current A4 full sized Parklands map for you to print out. Here is the original full Concept Plan document with all the details - and a full financial plan. This document will be rewritten once Green Hills negotiations for leases on the precinct land get underway, following the master planning process. See a slideshow of photos taken on the Precinct land in 2003. See a slideshow of photos taken during the recent open day in August 2007. See a slideshow of photos of the northern wetland area in heavy rain taken on 24 Aug.
See a 360 degree panorama of the Precinct site (QuickTime plugin required 512kb).